Katie was originally placed by our group when she was young in April of 2007. At that time she was called "Gully". She was named Katie and returned in 2008 due to a serious health problem of one of her owners. She was rehomed with her latest owner in April of 2008. Her current owner is choosing to re-homing Katie at 12 years old because she doesn't think Katie is happy after a divorce, move and schedule change. Katie just turned 12 on March 19th. 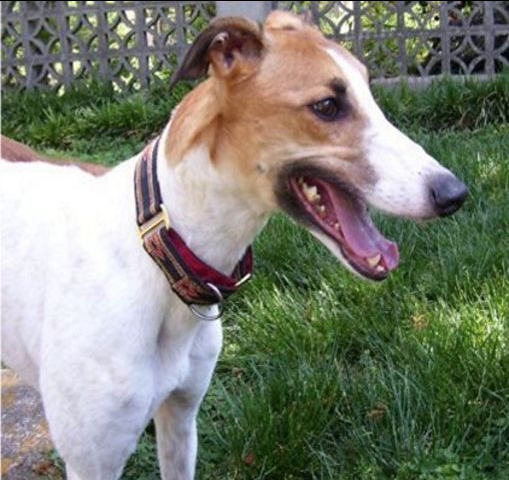 Katie raced only 4 races at the now closed Jefferson County Kennel Club in Florida. She finished toward the back of the pack in all her races, so she was retired young at just 2 years old. We had Katie checked by our vet to be sure she was healthy. Other than a corn on one of her feet, that causes a limp on hard surfaces, she got a clean bill of health. She has lived with cats and small dogs so should be fine to live with both. She is actually going back to her original foster home and they have already decided to keep her, so she isn't available at this time. Katie travels well and wants nothing more than a soft couch to lay on. She is very laid back at her age and just is happy to nap most of the day. She is friendly with everyone. Her sire is Trojan Cruze and her dam is RK Goin Topressu. Her photo is one we had from when she was young.